It's been several years and updates since I last played Cortex Command, I expect the file system/module system has changed a lot since I last used it (not that I would remember how it was set up anyway). However, in between commitments I wish to make progress on what I was working on before. So at the present time, there are a few things that I'm trying to do. I would like to add custom assets that I have made, to the map that I was working on, "Tettaia Dusts", preferably with editing the least base/stock game files as possible (if not none at all). Most of these .ini files contain only one entry, I'm just trying to learn how to get these assets to load into Cortex Command without crashing before I continue with adding more. Hopefully somebody could be able to help me get this working, then I should be able to carry on with these elements from example. Thanks in advanced for the help. Why don't you just let download your whole rte module? I would have preferred to first show the finished product, though. Well, there's nothing wrong with your ini's there's something wrong with your bitmaps. First most bitmaps CC uses (except glows) can't be 32-bit, they must be 8-bit color depth bitmaps with a specific palette. The best way to get such bitmap is to copy an existing scene, material or background bitmap, open it in your graphical editor and then paste whatever you want to have in it. BTW newest ms paint is known to break palette, photoshop and gimp should work just fine. I pasted the image file ontop of another stock CC image and exported it to .bmp although I still receive the same error. Not sure what I'm doing wrong. I'm unsure why you bumped because not a single other thread has had an update since you posted. So your image was not in palette. I'm not sure what image editor you used but I highly recommend you find a tutorial for it on how to use a custom palette, or utilize my own tutorial on how to do so in Gimp (my editor of choice). The pasting an image into a previously paletted Cortex image trick only really works in some editors (notably, the Windows XP version of paint), so I don't really trust it. I indexed it since I last uploaded that file, using gimp. I will try the version you sent. Edit: Nope, sadly still no avail. Not sure why it specifically doesn't work for me. These are big images, I wonder if it has something to do with the amount of RAM Cortex Command is allocated ... ? It's been a while since I modded, but I think you might also need the other bmps there? Don't know if that's the issue at hand, however. You mean the foreground and material? Those are actually included. Unless you mean something else. Edit: I'm starting to have a feeling it has something to do with the way Gimp exports indexed bitmaps, I tried it on an experimental image which prior to being re-exported, worked. I'm using the very latest version of Gimp (unless it's been updated within the past hour). I have been trying what weegee first suggested; pasting my desired graphic ontop of a duplicated-stock CC image in order to match its colour palette. Maybe I'm missing a necessary plugin for exporting 8 bit images/bitmaps or something? Edit2: Okay, it was. Gimp wasn't exporting the indexed palette/8-bit depth properly, I had to break out an obscure program which can modify palette information and such which I found after doing some searching. The program is called "IrfanView", to note, for anyone else having bit-depth/palette problems. TerrainObject's bitmaps are null when drawing! Would be nice if this just worked. 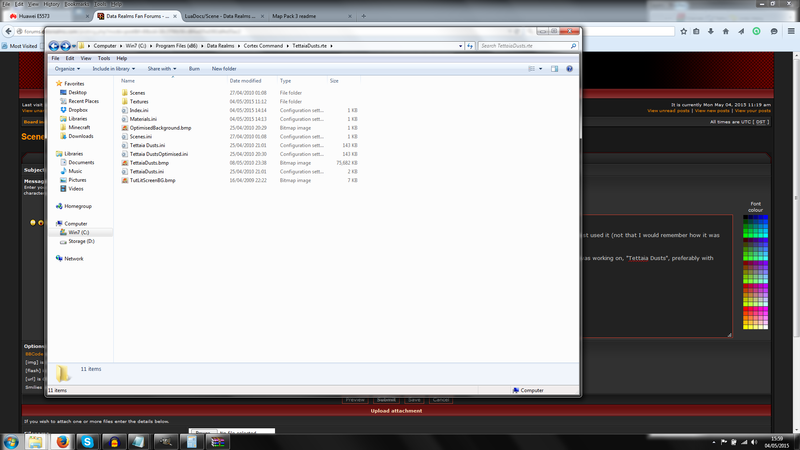 I also forgot to mention, I am using build 30, I don't know if build 31 fixes most of these problems that I'm having.